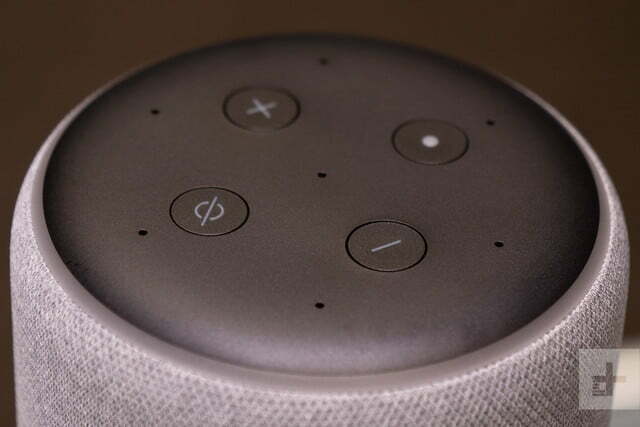 When we heard that Amazon was planning to introduce a second generation of its Echo Plus speaker with Alexa voice assistant and built in smart hub, we assumed that the powers that be would include Z-Wave compatibility this time around. After all, that was one of our only gripes about the first generation model – that it was really only half of a built-in smart hub that featured Zigbee connectivity only. 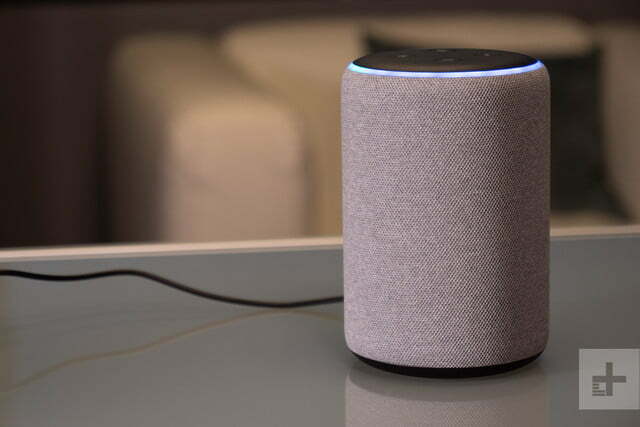 With this second-generation model ($150), Amazon didn’t add Z-Wave like we hoped, but they did add a couple other interesting features, including a built-in temperature sensor and a bigger neodymium woofer, which makes the new Echo Plus the best-sounding standalone speaker in Amazon’s Echo fleet. There are other things that impress us about the device and which might make you want to fork over $150 for the device in lieu of a regular Amazon Echo speaker, which comes in at $100. Read on to find out why. The first generation Echo Plus was introduced about a year ago and took the same form as the very first Echo device – a tall Pringles-like speaker with a metal frame. To say the 2nd generation looks different is a huge understatement. Amazon has decided to completely change the looks of the Echo Plus, giving it a more petite round look with a fabric cover. 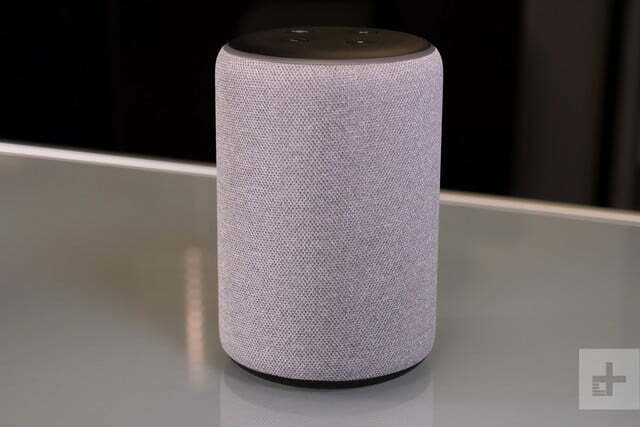 It now looks more like a mini Echo device (bigger than an Echo Dot, though). At 5.8 inches tall, it’s a little over half the height of the original, which was 9.2 inches tall. You can choose from three different colors: Sandstone, Charcoal, or Heather Gray. The top of the device is different as well. 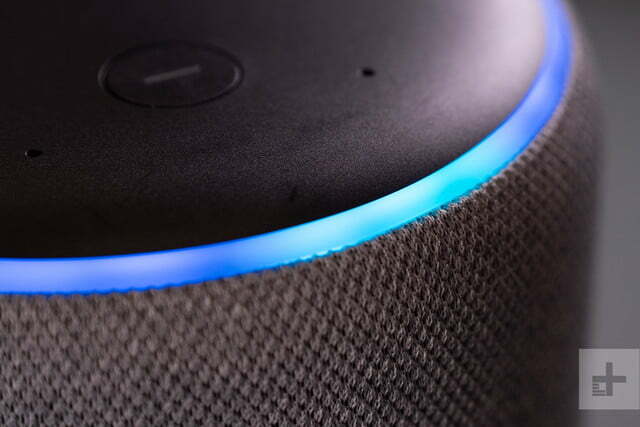 Gone is the volume adjustment ring around the rim (although there’s still a ring that lights up blue when Alexa is listening). Instead, there are four buttons on the top: volume +, volume -, mic on/off, and action. On the back are the AUX audio input/output and the power port. There’s a non-skid silicone bottom that makes it less likely to slip around. The device’s lower center of gravity makes it more stable than the previous generation. 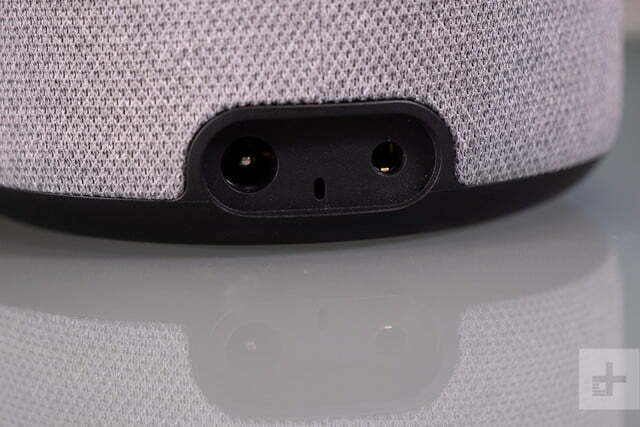 Overall, the improvements give the speaker a serious upgrade in the looks department. The new one definitely features a more rich, refined look. Connecting the Echo Plus to the Amazon Alexa app is as easy as plugging the device in and opening the Amazon Alexa app (you’ll need to download it if you don’t already have it). Once plugged in, the ring along the top of the Echo Plus will swirl with reddish orange colors and then notify you that it’s ready for setup. Open the app to select the Wi-Fi network you’ll be using and then enter your Wi-Fi password. 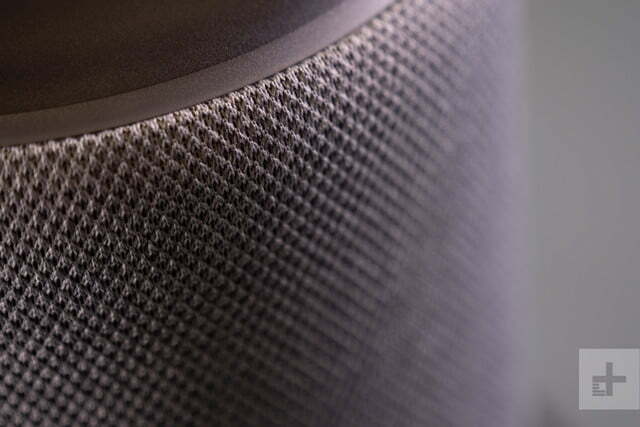 Overall, the improvements give the speaker a serious upgrade in the looks department. Once those steps are taken, you watch a quick video tutorial in the app which, unfortunately, you can’t skip. We initially connected our Echo Plus to the office Wi-Fi network and had to watch the video. Then, when we took the device into one of our smart homes and connected to a different Wi-Fi network, we had to watch the video again without the option of skipping it. Thankfully, it’s only a couple minutes long. After the device is up and running, hit the button on the bottom right of the app that’s shaped like a home to connect any smart home devices you wish. If this is your first Echo device, you’ll need to do much more, too, like connect your streaming music accounts, change the device wake word from “Alexa” if you choose to, set Routines, and more. You can also pair the Echo Plus with another speaker or the new Echo Sub subwoofer for stronger sound if you wish. Alexa, who won the game? Under the hood of the speaker lives the voice assistant Alexa, which can help with all kinds of things. Essentially, once an Echo speaker is set up, you can ask the voice assistant to do everything from lock your doors to telling you who the 21st president of the United States was (answer: Chester Arthur). Ask: “Alexa, who won the Seattle Seahawks game?” and she’ll give you an answer. Say, “Alexa, play my Paul Simon playlist on Spotify,” and your playlist will begin playing, assuming you have such a playlist and you have your Spotify account connected to the device. Many people use the device to set kitchen timers, play games, make phone calls, get morning news briefings, and so much more. 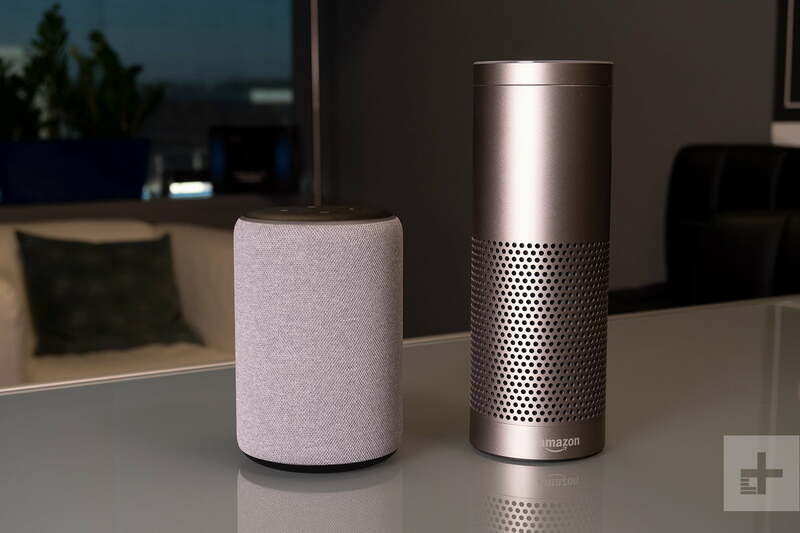 Aside from the voice technology, the device helps you automate your home with only voice commands, once smart devices like locks, lights, and cameras are connected via the Alexa app. Alexa, what’s the indoor temperature? We tested out the smart home functionality of our Echo Plus with Amazon’s new smart plug as well as a Philips Hue light bulb and a few other devices we had already connected to our Alexa ecosystem. Linking the smart plug was about as easy as it gets, as plugging it in triggered a notification in our app asking us if we wanted to connect it to the Echo Plus. We plugged our old-school slow cooker to the device, threw some chili ingredients in, and then said “Alexa, turn on first plug”. The plug clicked on, our slow cooker clicked on, and we were well on our way to dinner that night. The Philips Hue light bulb was similarly easy – we screwed it into a nearby lamp, turned the lamp on, and went to the Alexa app to add it to the list of devices. From there, we could ask Alexa to turn on the downstairs lamp (which is what we named it in the app) whenever we walked into the room. 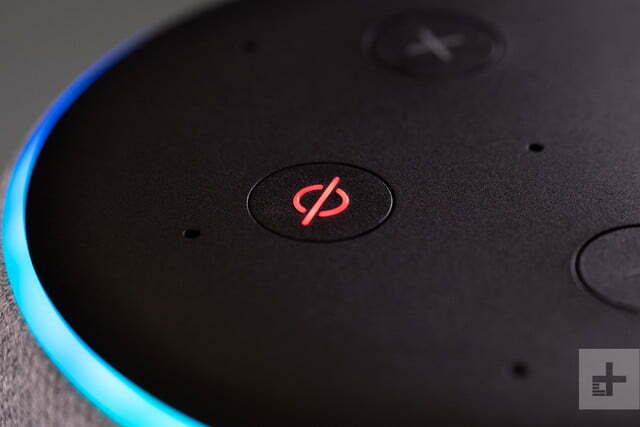 A couple things to note: We had trouble getting existing smart devices connected to another household account to work with the Echo Plus. 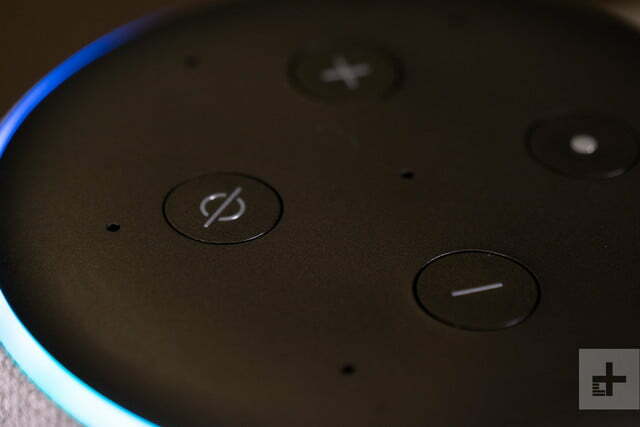 So, for example, if a spouse has a household Alexa account with some smart devices attached, you can’t then also connect to those devices via the Echo Plus. A bit annoying, but you can ask Alexa to switch accounts in order to control the devices. If your smart home device is Z-Wave compatible only, you won’t be able to connect it. Also, we mentioned before that the Echo Plus does not include Z-Wave compatibility. What does that mean? It means that unless the smart light bulb, plug, or lock you have connects via Zigbee, you’ll still need the device to be specifically Alexa-enabled or you’ll need an additional smart hub to connect to it, like Wink or Samsung Smartthings. 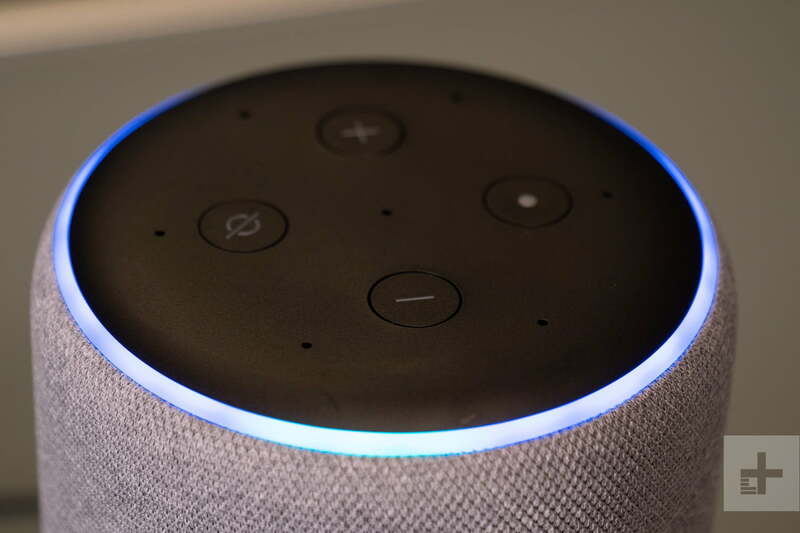 That means that if you’re using the Echo Plus as a primary smart home hub, you’ll need to specifically check to see if the device is Alexa-enabled or if it connects to the Internet of Things via Zigbee technology. If it’s Z-Wave compatible only, you won’t be able to connect it. Lastly, the built in temperature sensor seems accurate within a degree or so. We compared it to readings from our Ecobee3 thermostat and got slightly variant temperatures. For example, Alexa told us the indoor temperature was 71.4 while our thermostat told us it was 70 in the same room. You can find out the temperature in the room via Alexa by either asking, “Alexa, what’s the temperature indoors,” or accessing the information through the Alexa app if you’re out of the house. As we alluded to before, by far the most impressive upgrade to the Echo Plus is the improved sound quality. It’s louder, richer, more balanced, and an all-around great speaker for its size and price point. 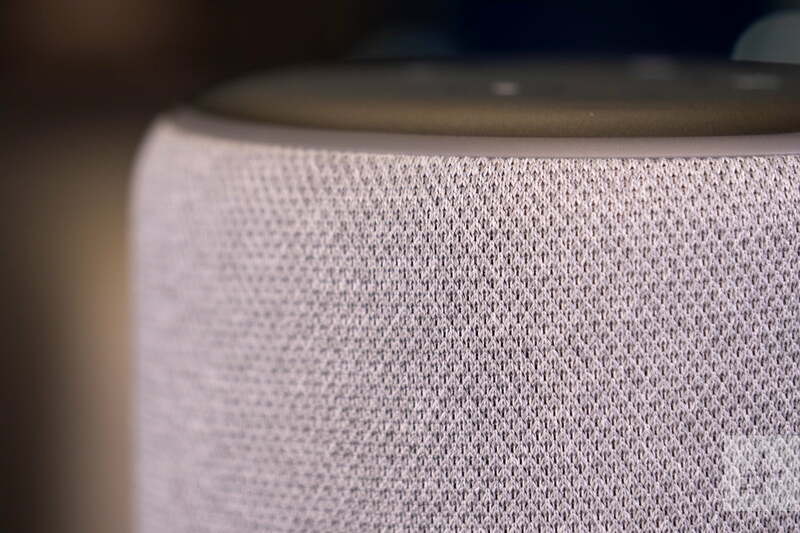 While the first-generation Echo Plus speaker featured a 2.5 inch woofer and 0.8 inch tweeter, the newest model features a 3.0 inch neodymium woofer and 0.8 tweeter. Compare that to the 2nd generation Echo, which has a 2.5-inch woofer and 0.6-inch tweeter, and the sound is vastly improved over both devices. It’s likely Amazon’s work with Dolby on voicing the speaker has a lot to do with the upgrade. We did a side-by-side sound comparison of the original Echo Plus and 2nd generation Echo Plus by playing Bruno Mars’ Uptown Funk on both devices, and there was a stark difference in sound quality. The newer device was bolder and held bass well, while treble was smoother and much less tinny. The balance in sound was clearly more complex. The second-gen Echo Plus is clearly Amazon’s best-sounding speaker available. Still, if you’re looking for more clarity and boost in bass than what the Echo Plus can provide, you can always pair it with the new Echo Sub. You can also pair a second Echo Plus to your home for stereo sound, or, better yet, run a stereo pair of Echo Plus speakers with an Echo Sub for an impressive 2.1 system. The Echo Plus comes with a one-year limited warranty and service. You can purchase additional one-, two-, or three-year extended warranties separately. 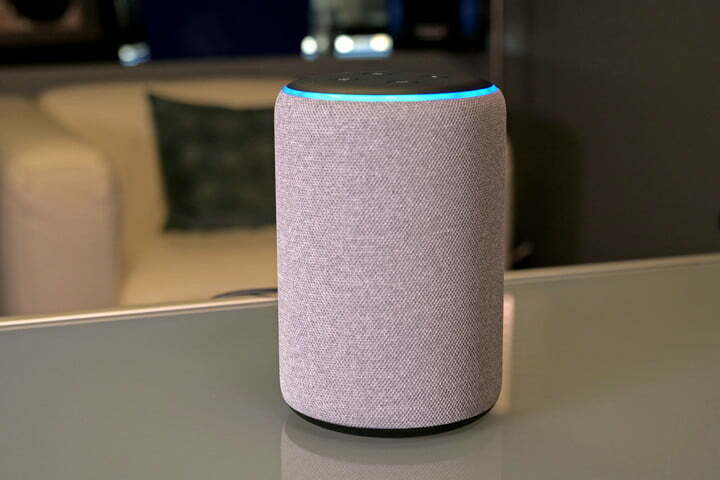 While the smart home capabilities of the Echo Plus are only marginally enhanced by the Zigbee smart home hub and built-in temperature sensor, with Alexa voice assistant and a vast improvement in sound quality, the Echo Plus second generation is a great option for those looking for an all-in-one speaker to build sound and smart home capabilities. It depends. If you don’t need the smart hub, consider the Amazon Echo speaker. While not as strong in sound, it’s cheaper at $100 and will connect to almost any other speaker. If sound is what you seek, we’d still recommend the Sonos One Alexa-enabled speaker ($199) as the way to go. The Sonos One features Alexa voice assistant technology and can do almost anything an Echo device can do. 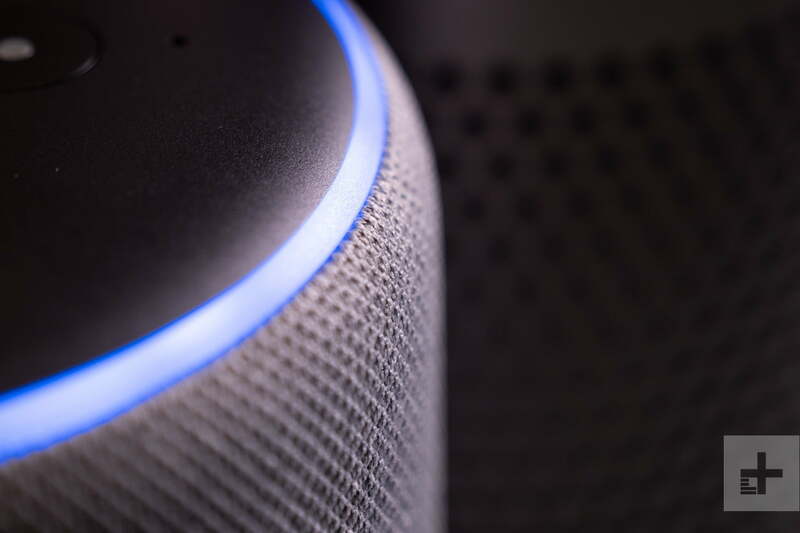 It’s a safe bet that Amazon will continue to issue firmware updates to improve Alexa voice assistant technology (in fact, they recently completely overhauled the app for a more simplified experience). While we can’t guarantee that Amazon won’t release a third-generation Echo Plus next year or the year after, we can assume that the devices will still work with Alexa technology as long as it exists. We also think that the new design of the Echo Plus means the outside of the device will show less wear and tear than the original. Buy it if you’re looking for an all-in-one smart home hub and great-sounding speaker rolled into one. If you already have a smart hub set up in your home, consider another Echo device like the original Echo or third-generation Echo Dot ($50). You can always use any Echo speaker to feed bigger, stronger sound systems you may already own.